We are pleased to announce that Catarina has won our contest, correctly identifying all seven Symington family members as well as António and Miles. A case of 6 bottles of Graham’s Quinta dos Malvedos Vintage 1999 and a bottle of our 40 Year Old Tawny will be sent out to her home, here in Portugal. Catarina enjoys Graham’s and has visited our Lodge in Gaia – clearly she paid attention during her tour! Congratulations Catarina! On the other hand, your blogger learned a hard lesson in proofreading, and has forfeit a bottle of wine to Miles for having mis-spelled his name in the original post (now fixed)! Thank you to everyone who responded to the contest! Do You Know Your Symingtons? As mentioned in a previous post, the Symington family, SFE directors and many other staff were in Provesende recently for the blessing of the new ambulance. Here is another photo of everyone gathered and looking on during the ceremony. There are seven members of the Symington family in this photo. If you can identify by the red numbers in the photo above all seven members of the family by name, and also define the parent/child relationships fully and correctly, you will win a case (6 x 75 cl) of Graham’s Quinta dos Malvedos 1999 Vintage Port. If you can spot Miles Edlmann in the crowd and António Silvano, the caseiro at Quinta da Cavadinha (the flagship Warre’s quinta), you will win a bottle of Graham’s 40 Year Old Tawny. Note that if you click on the photo it will open full size and you can see a little more clearly. You will need to use your browser back (<) button to return to the blog page. 1. We turned off the comments function for this post, you must respond by sending an email to us at: blogadmin at grahams-port dot com (we are spelling it out here to avoid spam, but you need to use the usual symbols for at and dot). Give us the red number and the name of each of the seven Symingtons, and describe the parent/child relationships among the people in the photo. 2. You must be of legal drinking age for your country and state or province. 3. Employees of Symington Family Estates or their distributors and family members are not eligible. 4. The winner will be the first email received with the correct answer. We will identify one winner for the case of vintage and one winner for the bottle of tawny. 5. The wines can be shipped to you anywhere in the world, or if you are (or will be) in Porto, we can arrange for pickup at the Lodge (and give you a free tour whilst you’re there!). 6. Decision of the judges is final. We will announce the completion of the contest and the winners here in the blog. Symington Family Estates donated a fully equipped ambulance to the village of Provesende, in the Douro. The Symington Family and all who work with them donated a fully-equipped ambulance to the Volunteer Fire Brigade of the historic Douro mountain village of Provesende on Monday 17th January. This donation continues the policy that Symington Family Estates have followed for several years of annually donating equipment to worthy causes in the Douro region, where the family have long and historic ties. In previous years, ambulances have been given to the Volunteer Fire Services of Sao João de Pesqueira and Pinhão as well as specialist medical equipment to the hospitals of Vila Real and Alijo and to the Red Cross Association of Sabrosa. This year’s donation took place in the presence of the Civil Governor of Vila Real and the President of the region of Sabrosa as well as the Mayor of Provesende and other local dignitaries. The local parish priest, Father Antonio Areias, blessed the new ambulance in the crowded town square of Provesende. All present hoped that Father Antonio would not need the ambulance himself anytime soon. This was not an idle wish as Father Antonio is known to be a fiercely competitive trail bike rider, regularly leading other bikers (including members of the Symington family) on hair-raising rides on muddy mountain tracks deep in the surrounding mountains when he is not attending to his flock in the many Douro villages that fall into his parish. The hand-over ceremony was conducted by the five members of the Symington family who work in the family business: Paul, Johnny, Rupert, Dominic and Charles. Their fellow company directors, Antonio Filipe, Carlos Caldeira, Jose Alvares Ribeiro and Luis Martins were also present as was Michael Symington, aged 85, who retired from the family business 20 years ago in 1990 after a lifetime making Port and who continues to farm his own vineyard nearby. Readers of the blog will be familiar with our passion for quality and our attention to all the details of the viticulture and winemaking behind Graham’s Ports. That same attention and passion is applied to every step and every component part of the process which delivers our wines to your tables. Take for example, the cork in your bottle of vintage port: a piece of natural material typically 49 millimetres long and 24 millimetres wide. How detailed and passionate can you get about that? Imagine yourselves in our shoes: we worked for a year in the vineyards to grow and tend those grapes (we won’t even try to count the years of work that have gone into the vineyards), we knocked ourselves out working 24/7 during the harvest to vinify them in the best possible way, we nursed the wines in our cellars for two years for the Vintage wines (and even longer for other port styles), constantly tasting, blending, storing carefully, monitoring the quality of the wine itself and ensuring that every step in the handling of that wine from cask to bottle to you maintains that quality. There’s nothing more satisfying than cleanly pulling out the cork and then settling down to enjoy a well-aged vintage port with family and friends. Need we say it? Being let down by 49 mm x 24 mm of cork absolutely breaks our hearts. So, yes, we do get extremely passionate and detailed about trying to ensure the quality of the corks we use in Graham’s ports. From every batch of corks delivered to us, we remove a significant sample quantity and run a half dozen different tests to assure ourselves of the quality of those corks before they are released for use in our bottling plants. 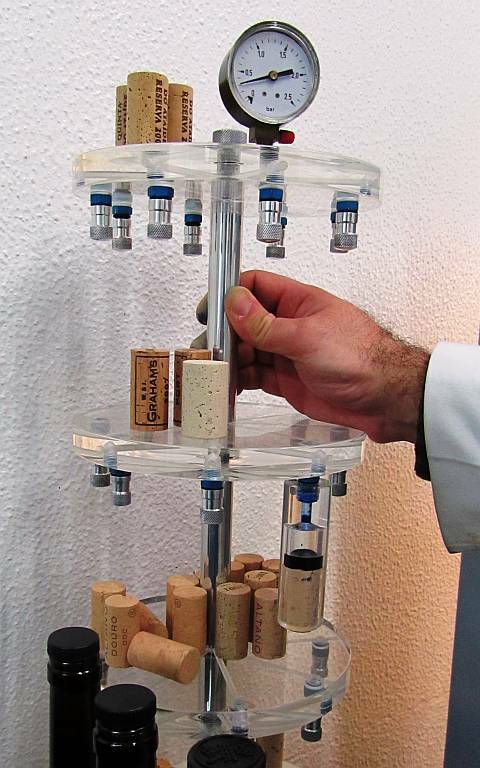 The technicians in our quality assurance laboratory have full power to reject an entire shipment of corks if the test samples fail to meet our standards for any of our tests. First is a test specifically for TCA. What’s that? Careful what you ask: it’s 2,4,6-trichloroanisole, or, for the layman, it’s the by-product of a chemical reaction which creates that smell commonly referred to as “cork taint.” To try to ensure the corks will not cause this type of reaction, we select sample corks and immerse them in a special alcoholic solution for 24 hours. After 24 hours we smell the solution – if the lab team detect any whiff of TCA we will reject the entire batch of corks, and not even bother to test further. Next, we pour out some port into a petri dish, and set five corks into the dish for 24 hours, to check the rate of absorption of wine by the corks. Tests are also performed to determine how much pressure is required to extract a cork (ideally between 20 and 40 kg), and how much to force the cork down fully inside the bottle (not less than 15 kg), to ensure the cork will be snug within the neck and create a good seal. Finally, two more tests are made to determine the absorption of liquid by the cork. In one test, bottles are filled with azul metallica, an intensely blue-dyed water, corked, and laid on their side for a week. The other test fills a “bottle neck” with the azul metallica, corks it, and then creates a pressure of 1 bar inside the neck. After a week we extract and examine the corks from both the bottles and the test-necks to determine if any blue dye has been absorbed into crevices in the cork. Only after all these tests have produced satisfactory results will our Quality Control lab approve a batch of corks for use in bottling. But we don’t stop analysing the performance of the corks with pre-bottling tests. 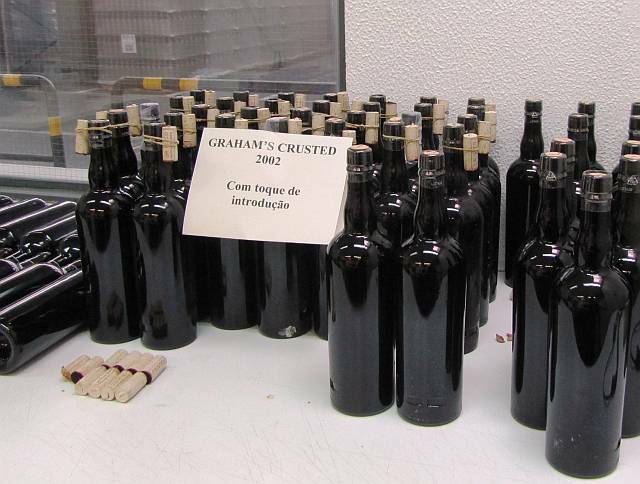 On a routine basis we will call in 30 bottles of a vintage port from storage at the lodge, extract the corks, and promptly re-cork the bottles. We then examine the original corks to monitor their performance, and take any action we feel necessary to ensure the continued quality of our stored wines. Possibly the most critical thing about cork is its compression inside the bottle neck – but we are so passionate and detailed about that, it will take a dedicated article to explain it properly. Stay tuned. Great photo of the interior of the Lodge, taken by one of our Facebook friends, Adrian J Cassar Gheiti. At Graham’s, we receive a lot of inquiries about working for us. We don’t blame you – we think it’s an enviable job to work anywhere in the Port trade, whether in Gaia or the Douro, in the offices, the Lodge or the vineyards. So… here’s your chance. We are looking for guides to work at our Lodge in Vila Nova de Gaia this summer. Though “only a summer job” (which in fact starts in March and runs into the autumn) it is an incredible opportunity – you will learn more about Port in this job than you could ever learn in most specialist wine courses, and you will have the opportunity to taste some extraordinary wines and visit our vineyards and wineries as part of your training. Wonderful group who visited us from Turkey, with their guide, Herminio, on the left. On the other hand, don’t underestimate the work of being on your feet all day helping our visitors – this is a demanding job. You will be leading tours, ranging from one person to a couple dozen, through our lodge all day, explaining how and where our wines are made and about the people behind the wines, and when the tour of the lodge is complete you will serve port to our visitors. You need to be able to do all of this, as well as answer lots of questions, in at least three different languages. When you are successful, our visitors feel a real connection with Graham’s and continue their relationship with us long after their visit as a direct result of your ability to share your knowledge and enthusiasm. Given the volume of applications, both already received and expected this month, we will only be able to respond to those which we wish to take further. We are interviewing and making decisions this month, so don’t delay! Please also understand, if you are not from the area, we cannot assist you with accomodation or other logistics – those arrangements are entirely up to you. Gustavo Devesas, one of our veteran guides, after a particularly comprehensive tasting with a visitor group from Norway. Photo from one of our Facebook friends. Please read the job description and either stop by the Lodge with your CV or respond directly to the email below – using the usual symbols for the address (they are spelled out here to avoid spam). Please do not use the blog comments fields to indicate your interest or the blogadmin email address, as it will only slow down your inquiry – go straight to Turismo with your questions and your CV. O Centro de Visitas da Graham’s é uma óptima oportunidade para se ficar a conhecer mais sobre os Vinhos do Porto Graham’s e também sobre o Vinho do Porto em geral. Funciona nas caves Graham’s, construídas em 1890 com o objectivo de armazenar os vinhos da empresa e deixá-los a maturar nas melhores condições possíveis. Todos os anos recebemos cerca de 60.000 visitantes de várias nacionalidades. A função do Guia é receber estes visitantes, explicando a história da Graham’s e do vinho do porto. As entrevistas vão decorrer durante o mês de Janeiro para iniciar funções a partir do dia 14 de Março de 2011. Se estiver interessado deve enviar o seu CV para turismo at symington dot com (usa simbolos em vez de palavras) ou entregar na Rua Rei Ramiro nº 514, 4400-281 V.Nova de Gaia. Faithful followers of Graham’s Facebook page, website, or the wine press generally will be aware that our Quinta dos Malvedos 1999 Vintage Port won the Port Trophy at the International Wine and Spirits Competition (IWSC) in 2010. Naturally, we are pleased when our ports receive recognition, but the IWSC Trophy is particularly significant, as the competition is based on both blind tastings and rigorous chemical and micro-biological analysis. This trophy is a real tribute to everyone involved in making our ports to the highest quality every step of the way, in the vineyards, winery, laboratory, tasting room, cellar, and bottling plant. Though the award was announced last year, the physical trophy itself – a beautiful custom-engraved glass pitcher – only arrived recently. It’s not every day we actually get to see these kinds of things, so we agreed with Paul, we had to do something special with it. Naturally, we thought of a blog post with a nice photo, couldn’t be easier. Till we tried to take the photo. If you have ever wondered about a day in the life of the wine blogger, here’s a good example of the highs and… other moments. Paul, we tried, we really really tried, to do it justice. Click on the first image to open it in a new page and then follow the story in the captions, using the hyperlinks at the bottom of each photo to move back and forth in the sequence. Oooh, nice shot of the photographer, the camera (especially the strap), and the blogger hovering in the background, shame about the trophy. Then we thought maybe it will work better NOT filled with port, so we emptied it (don’t ask). By the way, if you were wondering, the trophy holds about two and half bottles of wine. Oops, might look better if we washed it out – and it does, sort of, except that it’s engraved on both sides and with the reflection from the silver tray and windows on two sides of the room (north and east) the effect is a bit dizzying, and not very legible. Best shot we could get, though still too much reflection from light fixtures and windows. Maybe the next time you come to the Graham’s Lodge in Gaia we’ll have it on display and you can see it yourself, to fully appreciate its beauty. 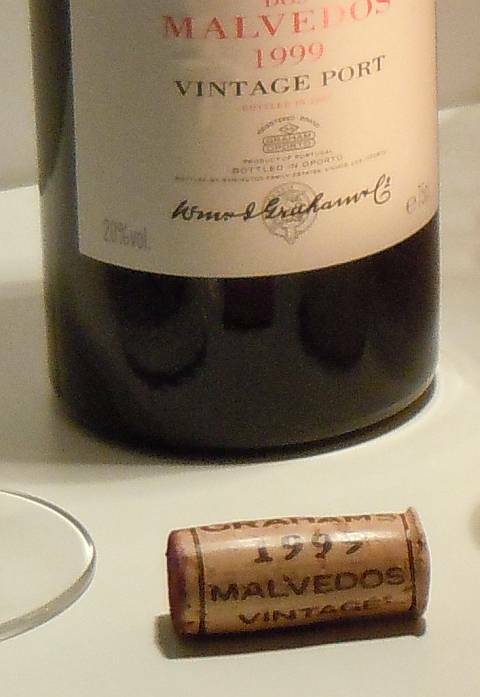 And while you are there, taste the beauty of a glass of Quinta dos Malvedos 1999 Vintage Port, too. In his summer editions of the Douro Insider reports, Miles Edlmann occasionally alludes to the need to “mow the lawn” in Graham’s vineyards. This may sound odd, but it is in fact one part of a very important and innovative system we have developed of using cover crops to manage the health of our vineyard environments. There are several facets to the programme: nutrition, disease and pest control, and water management, both conserving water in the dry summer months and managing drainage when we have heavy rains, usually in the winter. Miles’s research into the effective selection and use of cover crops as a single solution to all these issues has made a significant difference in the quality of our vineyards. This investment in research and the strategic application of our findings is one more factor which contributes to the outstanding quality of Graham’s Ports. The cover crops provide nutrients and improve soil quality for the vines in several ways over their lifecycle. In a newly planted vineyard we use clover, which fixes nitrogen in the soil, to help the new vines get a healthy start. When the crops are cut, the fallen plants form a natural mulch which ultimately decomposes and increases organic matter in the soil. In mature vineyards we may mix clovers with grasses such as oats or ryegrass to either encourage or control the vigour of the nearby vines. In the vertical vineyards particularly, where organic matter and nutrients tend to wash down the hillside, we plant clover at the top to nourish the vines in the poorer soil, and gradually introduce more vigorous grasses to the crop mix near the foot of the hill to compete with and thereby control the vigour of the vines at the nutrient-rich foot of the hill. Cover crops also provide a little healthy competition for the vine roots in the upper soil, forcing young vines to reach even deeper than the grasses to find an adequate water supply, which is crucial for the vineyards’ long-term survival. If you were a bee, wouldn't this be your idea of heaven? Finally, the bees love the crops, particularly the clovers, and their presence in the vineyards is always desirable – not least because their hives give us the wonderful honey served at meals in our quintas! Cover crops work in several ways to control both disease and pests in the vineyards. First, by providing a distraction from the vines for potential pests: in a chemically-managed vineyard weedkillers would be sprayed to prevent anything growing between or under the vines, particularly in the spring, during budburst. This effectively left no food for hungry pests like the vine weevil except the young buds of the grapevines. By planting cover crops we give the little darlings something else to eat, and lots of it, so they won’t go for the vines; also the crops provide a good habitat for the natural predators of the undesirable pests. By sowing our own chosen cover crops, we can crowd out the growth of more pernicious weeds that would cause us greater trouble in the vineyards. In this way we can minimise the use of herbicides, as our only other means of dealing with the really undesirable species is very time consuming manual weeding or cutting down. Some viticulteurs argue to keep both under and between vine spaces clear of growth, lest the vegetation create a too-humid atmosphere that might encourage either oidio (powdery mildew) or mildio (downy mildew). In general, we find this isn’t a concern – we do keep the under-vine space clear, and plant crops only between rows, which will be mown for the first time before they reach bunch or leaf-level of the vines. Furthermore, the summer season – and the vegetation itself – is usually much too dry for this to be an issue in the Douro. The cover crops are an incredible asset in aiding both drainage and water conservation. When it rains, we want the water to soak into the soil rather than run off down a hillside. The plants help accomplish this in several ways. First, rain which falls and is caught and held in the grasses will course down the stalks of the plants and ultimately into the soil, where we want it. Second, in heavy rains, the plantings form an obstacle course for any running water and slow it down, which gives it more time to soak in, and also minimises the erosion of topsoil and loss of organic matter in runoff from our vineyards, particularly any vertical plantatations. Finally, the plant material which was cut and left lying between rows as mulch acts as a sponge, soaking up water during the rains, and releasing it slowly afterwards, into the soil. During the incredibly hot dry summers the cover crops, even when cut down and left between the vines, shade and hold humidity in the soil. Our research has proven significantly lower soil temperatures and higher residual humidity where we have cover crops, which will help the vines cope with the summer drought conditions. In addition the stubble impedes air movement at soil level, so the hot dry winds typical of mid-summer Douro afternoons cannot dry out the soil as rapidly as they do on barren hillsides. All that in a blade of grass!